The University of Plymouth’s Nanomaterials and Devices research group, led by Professor Genhua Pan, has strong interests in the development and application of nanotechnology based biosensors as diagnostics in medicine and healthcare. 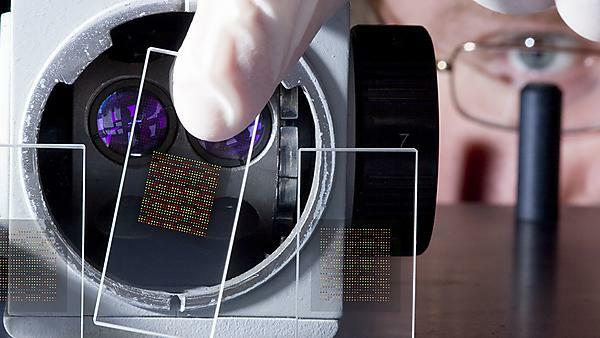 Current major research projects focusing on the development of nanomaterial based molecular diagnostic technology for dementia and cancer are funded by EPSRC and the EU Horizon 2020 Marie Curie Innovative Training Network programme. €3.7 million Horizon 2020 Marie Curie ITN funded, pan-European initiative to develop new approaches for and train the next-generation of researchers in the early diagnosis of brain tumours. Pan-European €3.5 million Horizon 2020 Marie Curie Innovative Training Network, to identify blood-based biomarkers for early-Alzheimer’s disease and develop associated diagnostic techniques. £1 mission research project funded by the Engineering and Physical Sciences Research Council (EPSRC) to develop an innovative, real-time diagnostic technique for dementia using graphene. These are truly interdisciplinary research with extensive collaborations in the UK, EU and internationally, and involve three Faculties at the University of Plymouth (Science and Engineering, Medicine and Dentistry and Business). The group’s research and innovation activities are underpinned by the University’s Wolfson Nanomaterials Laboratory, a cleanroom-based nanotechnology laboratory equipped with multimillion pound research facilities in thin film deposition, micro-scale device fabrication, and electrical, magnetic and nanoscale device characterisation. BBDiag is a pan-European project led by the University of Plymouth, funded by Horizon 2020 Marie Curie programme that could revolutionise the effectiveness of Alzheimer’s diagnosis and clinical drug trials. The initiative will address the lack of specific, sensitive and minimally-invasive biomarkers and techniques to identify people with the early stages of Alzheimer’s. BBDiag brings together leading academic and industrial experts from five major consortia across Europe. Together they are developing a multidisciplinary research and training programme to discover Alzheimer’s disease biomarkers, develop new biosensing techniques and ‘point of care’ tools, and maximise the technical exploitation of diagnostics. £1 million research project funded by the Engineering and Physical Sciences Research Council (EPSRC) to develop an innovative, real-time diagnostic technique for dementia using graphene-based biosensors. The team are developing a new way to detect multiple biomarkers found in bodily fluids which indicate dementia in the early stages of the disease, providing clinicians with real-time data and a conclusive test within minutes of the sample being taken. For further information contact the study lead Professor Emmanuel Ifeachor.